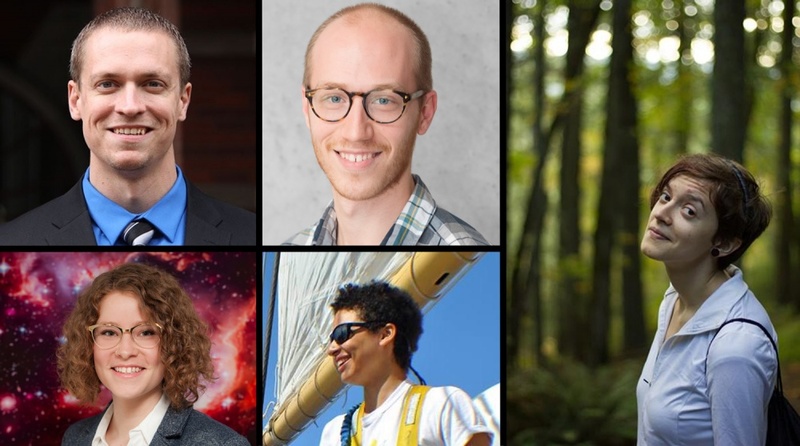 Twelve current, former and future Ducks have received 2018 graduate research fellowships from the National Science Foundation. The award recognizes and supports outstanding graduate students in NSF-supported science, technology, engineering and mathematics disciplines who are pursuing research-based master's and doctoral degrees. An additional seven UO students received honorable mentions. Graduate research fellowships support students for three years of graduate study. Students receive a living stipend, tuition waivers and travel funds. The fellowship is highly competitive, with only 2,000 being awarded each year to graduate students across the U.S.
Four awardees, Brendan Cullen, psychology; Ruth Maust, chemistry; Michelle Muth, geology; and Trevor Shear, chemistry, are current graduate students pursuing doctorate degrees at the UO. Three additional awardees, Ross Whippo, biology; Eliza Hernández, environmental studies; and Oriana Chafe, environmental studies, have committed to attending the UO as graduate students in the fall. Three awardees previously received their bachelor’s degrees at UO and are now pursuing their graduate studies at other universities. They include Taylor Dodrill, biological oceanography at Oregon Health and Science University; Drew McLaughlin, linguistics at Washington University; and Kendra Walters, ecology at University of California, Irvine. Two additional awardees, Hanna McIntosh, ecology, and Charity Woodrum, astronomy and astrophysics, are recently graduated and current undergraduate students, respectively, who will start graduate school in the fall. Considering the paths many past recipients of graduate research fellowships have taken in their careers, Woodrum is in good company. The list of alumni includes NASA scientist Amy Mainzer, Nobel laureate in physics Steven Chu and Google co-founder Sergey Brin. Woodrum will be working with a team for NASA's James Webb Space Telescope, the scientific successor to NASA's Hubble Space Telescope and the premier space observatory of the next decade. She will be studying some of the first galaxies in the universe to determine how they form and evolve through cosmic time. “These students serve as a testament to the UO’s strong tradition of training and involving undergraduate students in scientific research,” Hodges said. Several of UO’s awardees and honorable mentions attended a workshop led by Elliot Berkman, an associate professor in the Department of Psychology. Other awardees prepared their proposals in the Writing Science course taught by Benjamín Alemán, an assistant professor in the Department of Physics. Developed for undergraduate and graduate students in the sciences, Alemán’s course aims to help students improve their science and science communication, but it also aids young researchers in applying for the National Science Foundation graduate research fellowship. Berkman’s workshop was supported by the Office of the Vice President for Research and Innovation and the Center for Translational Neuroscience and promoted by the UO Graduate School. Berkman assisted students in understanding the application process and writing a high-quality fellowship proposal. The vice president’s office and the neuroscience center will continue to offer the NSF workshop each fall in an effort to increase the number and diversity of applications in the future. Alemán will be teaching his communicating science course as Physics 410/510 in the fall.